This classically inspired floor clock makes a grand addition to our Furniture Trend Designs. 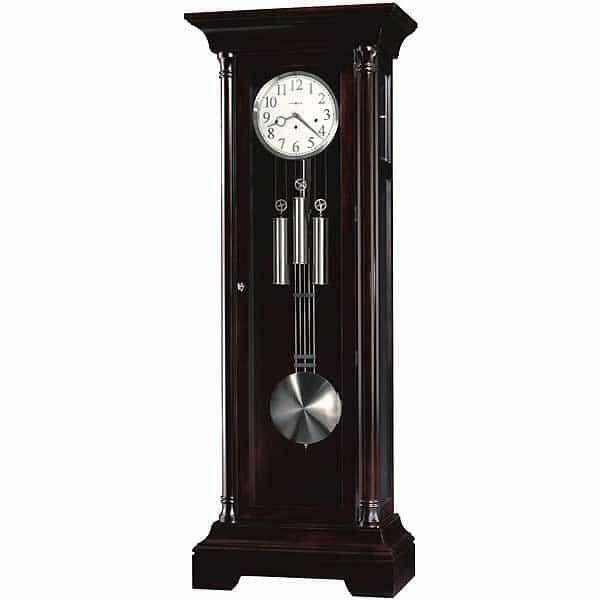 The simple, yet elegant, flat top pediment of this floor clock is reminiscent of classic Greek and Roman architecture. The door is flanked by twin canted columns with turned top and bottom caps. The crisp, white dial is framed by a brushed-nickel bezel and features applied, brushed-nickel Arabic numerals with a black screened minute track and nickel hour and minute hands. The brushed-nickel grid pendulum and nickel finished weight shells compliment the bezel. Clean lines and a simple cutout on the base complete the composition. All glass panels on the front and sides are beveled. In addition, the upper side glass panels are removable, allowing easy access to the movement. Designed by Chris Bergelin. Features light distressing. Cable-driven, triple chime Kieninger movement offers automatic nighttime chime shut-off option. Black Coffee finish on select hardwoods and veneers. Adjustable levelers under each corner provide stability on uneven and carpeted floors. You will receive a free heirloom plate, engraved with name and date, by returning the enclosed request card to Howard Miller. Locking door for added security.